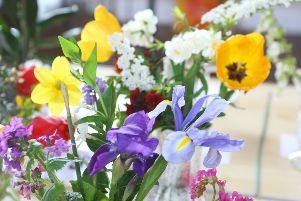 Southwick and Fishersgate Horticultural Society celebrated its 100th summer show with a fabulous display of flowers and vegetables. The dahlias and gladioli on show at Southwick Community Centre on Saturday were especially colourful. Judge Dave Vivash was impressed with the quality of the flower and vegetable entries, despite the prolonged spell of hot and dry weather experienced in the run up to the show. The floral art judge reported a high standard of exhibits, too. Alan Andrews collected the most points overall in the horticultural classes to secure the Banksian Medal. Alan also won the Percy Fowler Memorial Salver for his trug of vegetables and the GH Alderton Challenge Cup for most points in the vegetable and fruit section. Ted Banks made a clean sweep of the dahlia section, winning the National Dahlia Society Silver Medal and the Harold Catten Cup for most points. The judges were also pleased to see entries from children who had grown their own vegetables and a celebration of Glebe Primary School’s gardening club achievements this year. The autumn show will be on Saturday, October 27. Monthly meetings are held on the first Tuesday each month in the Garden Room at Southwick Community Centre. For more details, visit www.sfhorticulturalsociety.org.uk and follow on Facebook. Alan Andrews, Percy Fowler Memorial Salver, GH Alderton Challenge Cup, Banksian Medal. Julie MacCulloch, Blanche Sheppard Memorial Trophy, Flinn Challenge Cup, Gorringe Challenge Cup, National Dahlia Society Bronze Medal. Alasdair MacCulloch, Frampton Rose Bowl, Elder Cup, Southwick Gladiolus Shield, British Gladiolus Society. Ted Banks , Harold Catton Cup, National Dahlia Society Silver Medal. Ruth Stanyon, Betty Collins Memorial Trophy. Gordon Wellfare, Begonia Cup, Leslie Allebone Cup. Jayne Pumfrey, Eric Kiaer Trophy for best pot plant, Doris Fothergill Memorial Trophy. Alan Langridge, Albert Pettit Memorial Cup.